Turn up the heat and add a bit of spice to your meals with these winning hot peppers. Add them to your garden, flower borders and containers for added beauty and easy picking. 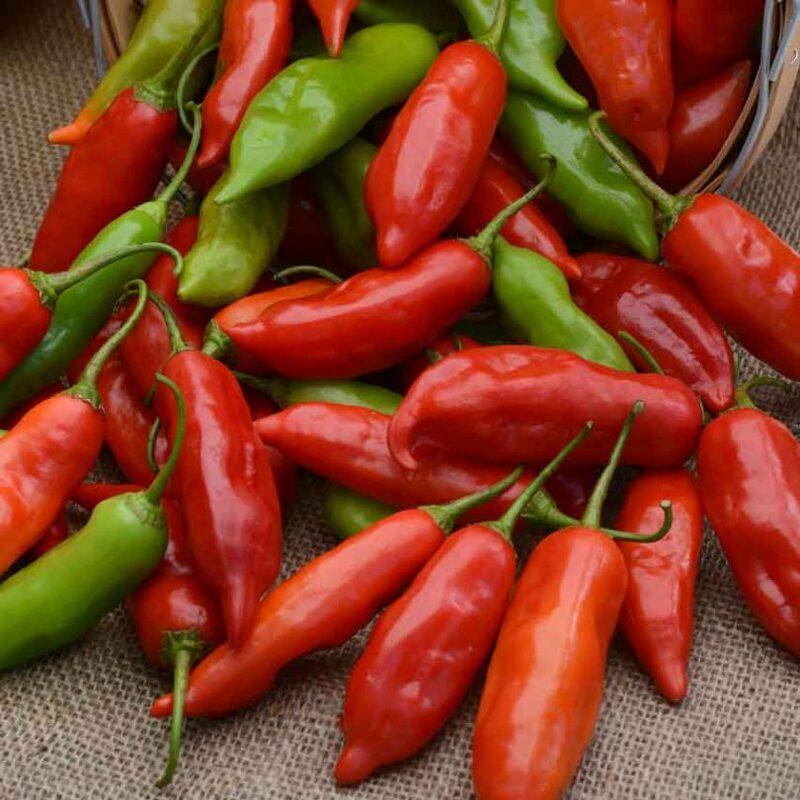 Grow a few cayenne peppers if you like Mexican, Cajun and Asian cuisine. They also add a bit of zip to dips, stews and marinades. Brighten your meals and garden with the brilliant red and tasty fruit of Red Ember. This 2018 AAS winning cayenne pepper is pretty enough for flower gardens or containers. You’ll be harvesting earlier and longer, providing more time to use and enjoy them. For a mildly spicy option with the same great flavor try Cayennetta. Its heat and cold tolerance makes it a great choice no matter where you garden. If you like it even hotter, include a few habaneros in the garden. Then add heat and flavor to jerk chicken, chili, jam and other recipes. For those who like the flavor of habanero, but can’t stand the heat, try Roulette habanero. It looks and tastes like a habanero in every aspect except its not hot. Roulette is the perfect solution for families with different heat tolerances. Add a full spectrum of color to containers and small space gardens with the early ripening Hungarian Mexican Sunrise and Sunset wax peppers. The conical shaped fruit transition from green to yellow, then orange and red. The fruit can be harvested and eaten at any stage. But the longer it is on the plant, the better the flavor. Mexican Sunrise is semi-hot, while Mexican Sunset is for those who like a bit more heat. Both can be eaten fresh, stuffed, baked, grilled or pickled. Grow a few Aji Rico peppers to add warm heat with a hint of citrus to your dishes. Eat them fresh or cook into salsa and hot sauces. Control the heat with the number of seeds left in the fruit. The more seeds that remain; the greater the heat. Roast them, use them fresh or string a few Giant Ristra peppers together to dry and use throughout the winter. Don’t be fooled by its appearance. This 7-inch chili pepper looks like a sweet Marconi but has the spiciness of a cayenne. For those who want to crank up the heat try Emerald Fire at 2,500 Scoville units. Not the hottest pepper on the market, but this jalapeno is certainly one to respect. The deep green fruit resists cracking and matures to red. Use them fresh, stuff with cream cheese, grill or can for later use. If your taste lies on the other end of the heat spectrum start with Chili Pie and work your way to some of these hotter varieties. These miniature bell peppers are mildly hot when the fruit turns red. Be careful not to mix them in with your sweet bell peppers. Heed this warning when growing and using any hot peppers. Clearly mark or better yet grow your hot peppers away from sweet peppers to avoid an unwelcome surprise. Keep your hands away from your eyes when working with hot peppers and wash them thoroughly when done. Most importantly, have fun growing and using hot peppers in your garden, containers and meals. These beauties combine nicely with other vegetables, herbs and flowers to create stunning garden beds and containers. And their spicy flavor is sure to help you create memorable meals this season. Featured image – Aji Rico peppers / All-America Selections. Melinda Myers has written more than 20 gardening books, including Small Space Gardening. She hosts The Great Courses “How to Grow Anything: Food Gardening for Everyone DVD set and the nationally syndicated Melinda’s Garden Moment TV & radio segments. Myers is a columnist and contributing editor for Birds & Blooms and writes for AAS. www.melindamyers.com.